Wikipedia recently celebrated its 17th anniversary! Wikimedians celebrate the occasion by holding Wikipedia Day events around the world. In New York, a great crowd of about 150 people gathered at the Ace Hotel in Manhattan for presentations, panels, lightning talks, unconference sessions, and cake. Given its active local chapter, New York hosts many Wikipedia-related events, but for me, Wikipedia Day is the highlight of the year. It’s one of the largest events, covers a range of different topics and activities, and makes for a great opportunity to make new connections as well as to meet in real life some of the people I’ve known through Wikipedia for years. 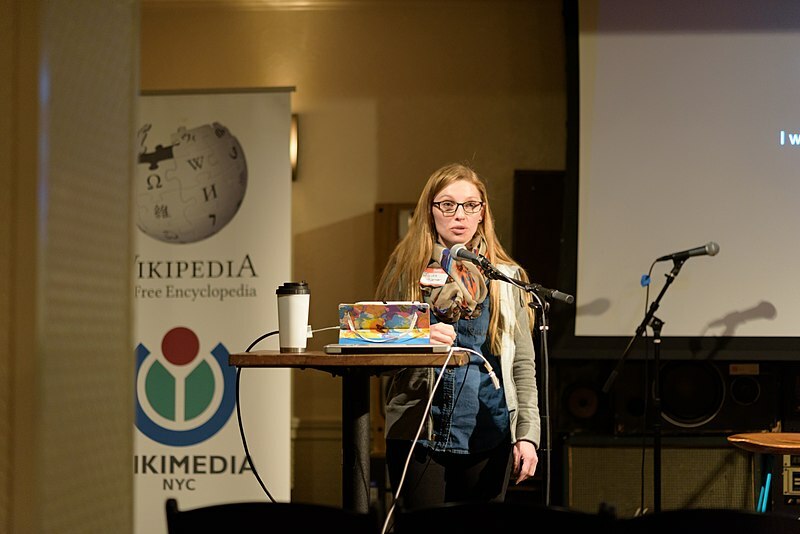 This year I had the opportunity to moderate a panel on Wikipedia in education, in which three of our New York-area instructors shared the exciting work they’ve been doing with their students. Rachel Bogan is a doctoral candidate in Sociology at the Graduate Center, CUNY, and a sociology instructor at the New Jersey Institute of Technology. She shared her experience incorporating Wikipedia into her Introduction to Sociology class last fall. She highlighted that having students contribute to Wikipedia not only provides them with a novel way of learning sociology, but also gives them new skills — new ways of reading, writing, and critically evaluating information. For a class in which most students will not go on to be sociologists, it gives them tools that they can apply to any field. I was really happy to hear the quotes she read from students’ reflections. One of them wrote that “none of my previous assignments had ever had an audience. On Wikipedia, millions of other people will be able to see my edits. Because of this, I had to be careful that I didn’t spread any false information.” Students feel a sense of responsibility and ownership, owing to the importance of Wikipedia in the way the public learns about the world. Shelly Eversley is Associate Professor of English at Baruch College, a constituent college of the CUNY system. For her, teaching with Wikipedia is directly relevant to both CUNY’s mission and her own education philosophy. As she put it, “education is not just about critical skills, but also about empowering the less empowered; empowering people so that they feel they have the right—the right—to change the world, and that in order to change the world they have to feel like they have the tools to do so.” She explained the ways that a Wikipedia assignment helps to develop those tools. Students in her class went to museums, galleries, and studios around New York to learn about art, and to engage with it directly after reading about it. They then contributed to Wikipedia articles about the artists — the article about Japanese-American sculptor Ruth Asawa, for example, which a student then translated for the Japanese Wikipedia. Students got excited about the idea of translation, realizing that being multilingual, as so many CUNY students are, puts them in a unique position to make extremely valuable contributions to Wikipedia. Other students translated articles into Russian, Ukranian, Spanish, and Bengali. Jeffrey Keefer is an Adjunct Assistant Professor at New York University in the Management and Systems / Human Resource Management & Development graduate programs. Jeffrey started his presentation explaining that just a year ago, he had a very typical negative attitude towards Wikipedia’s role in education — “it’s evil, stay away.” As someone who teaches students how to conduct research, much about the way Wikipedia works seems incompatible with research best practices. But take a closer look, and you can see that teaching students about Wikipedia and having them write articles can in fact be quite instructive. In such an assignment, students seek to find, analyze, and/or evaluate evidence supporting a claim. Jeffrey also made a point we hear pretty often, but which continues to be relevant — that although Wikipedia has many resources to help new users to learn and contribute, it’s hard to tell that help exists unless you know how to find it. He pulled up his class’s Dashboard page during the presentation to illustrate the ways the Dashboard brings together best practices, resources, structure, and training into one place. Watch the full education panel livestream here. Jackie Koerner presents on implicit bias, Wikipedia Day 2018. Another highlight of the conference was a presentation by Jackie Koerner, an independent qualitative researcher focused on issues surrounding bias and equality. Jackie is also the Wikipedia Visiting Scholar at San Francisco State University. She was invited to New York to present about implicit bias. The heading of one of her first slides was “Embrace Discomfort,” foreshadowing that the subject of the talk means people will be asked to think about their own biases, which can be, well, uncomfortable, but is nonetheless an important exercise. She illustrated implicit bias by asking the “cat people” in the audience what they thought about “dog people,” and vice versa, uncovering some preconceived notions about the type of person who would prefer one animal or another. It’s a good exercise. When she used it in a Wikimania presentation last year, the room got a little heated for a few minutes as people said some pretty cutting things about “the other side.” Our Wikipedia Day crowd was a bit mellower, but the activity nonetheless made its point well. Jackie explained that whereas conscious biases are the sort that we recognize as biases, and know that we may want to hide them, implicit biases are “sneaky” in that “you can only see them by looking at your past situations.” Implicit bias is deeper, unconscious. “It’s your default setting.” In the second half of the presentation she connected implicit bias to Wikipedia and offered advice for how to understand your own biases, how to work with others, and how to advocate for those negatively affected by such biases. See the livestream of Jackie’s presentation here. Wikipedia Day 2018 in New York was a great day, all around. Thanks so much to Rachel, Shelly, Jeffrey, and Jackie for helping to make it such an interesting event (and to the many others who participated!). Livestreams of all of the events in the main room of the conference are available online thanks to the Internet Society. Header image credit: File:Wikipedia Day New York January 2018 003.jpg, King of Hearts, CC BY-SA 4.0, via Wikimedia Commons.